If you already own Psych Aerious or buy along with this, you can get this ebook for half price. The owners of Unusual Clue can get THE: The Hand Experiments for half price. 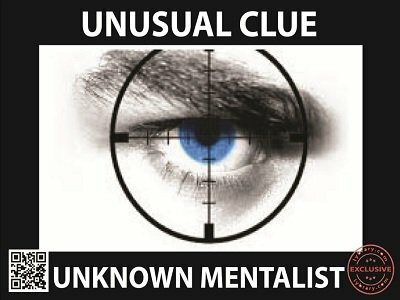 A unique and unconventional 'Psychic Detective' routine where the performer plays the detective and using an 'unusual clue' predicts the name of the criminal right in the beginning of the proceedings. A random participant names a random 'victim' - straight from his imagination. Another random participant names a random 'witness' - again purely from his imagination. These names are chosen totally at random and out of the blue and there is absolutely no force involved. Then using the 'unusual clue' (which is in full view right from the beginning), the participants zero in on a 'criminal' from a list of 'suspects'. This matches exactly with the prediction made by the performer. Self working and very easy to perform. Instantly repeatable with a different outcome. Nothing to reset. All you need is a small, normal, ungimmicked envelope and 3 business cards. The envelope and 2 of the cards can be reused multiple times. No sleights. No preshow. No stooges. Although this is designed for closeup and small groups, it can easily be adapted to parlor and stage settings. Powerful presentation with high impact outcome. Can be played humorously or mystically. Patter and script along with a couple of alternative handlings and some bonus ideas are included. A couple of indicative printable props for the suspect list are also provided.